The Accordion Babes make their triumphant return to Rhythmix for a thrilling night of music showcasing three red-hot acts. Led by some of the best accordionistas from Amsterdam to San Francisco, these bands will take you on a journey through waltzes, polkas, folk shanties, rancheras and jigs with influences from Cajun, Tex-Mex, gypsy rock, punk and hip hop cabaret. Sassy, sensual and always entertaining, the Accordion Babes will squeeze, saunter and sashay their way right into your heart. Advance tickets highly recommended. Cost: $25/advance, $30/day of show. All seating is General Admission. May 20 Freilichtbühne Mülheim an der Ruhr | 20.00Uhr. May 21 Potsdam. Radio Interview & live performance Radioeins - Happy Sad Radio | host Christine Heise. Alameda CA C'era Una Volta - Art and Wine Faire - Tara Linda jazz trio at C'era Una Volta in Redwood Square. 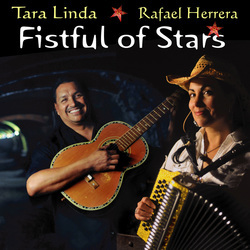 Oakland CA "Fistful of Stars" at Rooz on Park St.
Georgia Public Broadcasting - Feature interview on "The Jazz Spot", Atlanta GA.
Valentines Day at C'era Una Volta. Amnesia Prohibition Ball, San Francisco. Berkeley World Music Festival. Telegraph Ave.